Of all the bombers in World War II, we hoped to be assigned to the B-17—which we eventually did indeed fly during our time in England. The markings on the plane include the bomb group symbol, in our case the triangle U (the marking of the 457th Bomb Group) located on the tail section. Below that is the serial number—in this case 338594. Most planes were named; in this case, the name of the plane is Lady B Good, and the name usually was placed in the front of the aircraft. The position of the crew members is indicated on the drawing. Caption: A belly landing near Laon, France. Back row, left to right: Anthony O’Brien, navigator; Pierre Ribaut, French farmer; myself, radio operator; and Dan Nose, flight engineer. 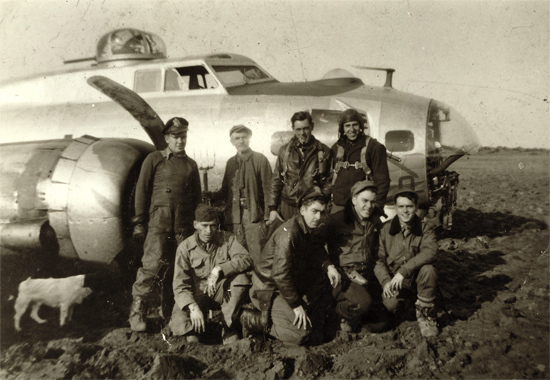 Front row: Murray Jett, copilot; Tommy Thompson, pilot; Bennie Johnson, ball turret gunner; Ralph Kenyon, bombardier. See the Links page for more information about the B-17.